The Canadian Horseshoe Falls in winter. Niagara has been experiencing record-breaking cold temperatures, transforming the area into a beautiful winter wonderland of icicles and snow. The Horseshoe, American, and Bridal Veil Falls are a breathtaking sight and now is the perfect time to visit Niagara Falls to experience their beauty and wonder. 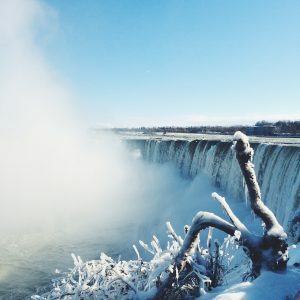 Bundle up in your warmest coat and take a walk to the brink of the Horseshoe Falls for a stunning view of the icy waterfall and surrounding parklands. And while you’re there you can also check out the one-of-a-kind Journey Behind the Falls attraction that gives you access to the 130-year-old tunnel system running directly behind the Canadian Horseshoe Falls and take in the sight of the frozen water from up close. For a warmer Niagara Falls viewing experience, you can book a relaxing hotel stay in a beautiful Fallsview guest room at hotels like the Sheraton on the Falls, Crowne Plaza Niagara Falls-Fallsview, or Marriott on the Falls, which offer views of the magnificent Niagara Falls from floor-to-ceiling windows. And for incredible Fallsview dining experiences check out Fallsview Buffet, the Rainbow Room by Massimo Capra, Milestones on the Falls, Morton’s Grille, or Windows by Jamie Kennedy Fresh Grill & Wine Bar. And for a quintessential winter experience in Niagara Falls, make sure to visit the Niagara Icewine Festival at the Scotiabank Convention Centre January 26th and 27th where you can experience the best Icewines from more than 20 of Niagara’s best wineries, delicious food pairings, and live musical entertainment.